The log house site at the Beaver Area Heritage Museum includes a variety of plantings of native grasses, wildflowers and herbs. These plantings demonstrate a natural setting typical of a log house homestead on Beaver’s frontier in the early 1800s. The surrounding wildflowers are native to Beaver County and could have been collected from local fields. 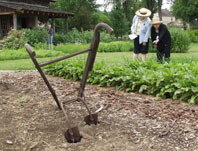 The intent of the gardens is to provide sustenance as well as plants that would have had medicinal value. An extensive vegetable garden flanks the main entrance path to the house, bordering and screening the hairpin fence along the adjacent railroad tracks. Climbing vegetable vines soften the screen while enhancing wonderful views of distant, wooded hillsides. Near the back of the house, herbs are planted where they are most accessible to the kitchen. Masses of fruiting shrubs, such as Currant and Cranberrybush Viburnum, complete the design. Plant species were selected from those available in the early 1800’s, and those tolerant of dry base conditions with minimal maintenance. Gardens of edible fruits, vegetables, herbs, and berries typify how the site functioned during its era. 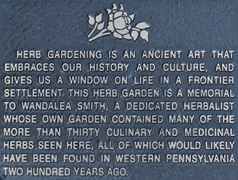 The herb garden is a memorial to the late Wandalea (Johnson) Smith, a longtime Heritage Foundation member and dedicated herbalist whose own garden contained many of the same culinary and medicinal herbs that are planted here. 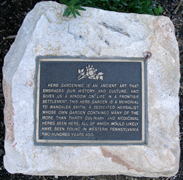 The memorial stone in the garden is seen here. 1 – Lavender – Many generations and many cultures have used lavender as medicine. Internally, it was used for indigestion, headaches, and bronchial problems. Externally, the herb was used for burns, cold sores, and insect and snake bites. The plant’s dried flowers were used as potpourri while its fresh flowers were added to jams. 2 – Roman Chamomile – Roman Chamomile was used to brew herb tea. The herb was used internally for digestive problems and colic, as a uterine stimulant and to relieve feverish illnesses. Externally roman chamomile was primarily used to soothe irritated skin. 3 – Mugwort – As a medicine, mugwort was thought to rid the body of threadworm and roundworm infestations. It also was used as a moth repellant and for pillow stuffing. 4 – Blue Hyssop – The leaves of the blue hyssop were often added to salad and also used in cough medicine. 5 – Lemon Balm – Lemon balm was used for both culinary and medicinal purposes. As a beverage, the leaves made a tasty tea. As a medicine, the herb was used to calm upset stomach, indigestion, heartburn and chronic fatigue. 6 – Borage – Like many other herbs, borage was used for both culinary and medicinal purposes. Its leaves made a tea that was said to calm stomachache, fever, gas and urinary disorders. 7 – Sage – Sage was made into tea and used for flavoring food. The flowers themselves were edible. Medically, sage was used to aid digestion and cure liver complaints. This herb was also used as a balm on insect bites, throat, mouth, and gums as well as skin infections. 8 – Marsh Mallow – It was believed that marsh mallow taken internally healed hernia, bronchitis, asthma, whooping cough, and urinary tract infections. People also used it externally as a treatment for boils, eye and skin inflammations, insect bites, splinters and gingivitis. In addition, the root was peeled and given as a teething aid. 9 – Fever Few – Like many other herbs, taken internally, fever few was thought to be a cure for migraine caused by ache, rheumatism, arthritis, minor fever illnesses and various digestive complaints. Used externally, it offered relief from insect bites and bruising. 10 – Chives – Still used today for culinary purposes, especially softening cheeses, chives were, and are, especially good with potatoes and eggs. Leaves and bulbs of the herb were used for garnishing and flavoring soups and salads, in omelets and in sauces. 11 – Oregano – Another herb still used extensively today is oregano. This herb was often eaten dried rather than fresh in dishes that contained strong flavoring such a chili, garlic, tomatoes and onions. Like most other herbs, there were also medical uses including relief from colds, indigestion and fevers. It was believed that it was also useful in treatment of bronchitis, asthma, arthritis and muscular pain. 12 – Red Currant – Red Currant berries were made into a healthful jam believed to relieve symptoms of colds and influenza. The plant was skinned and cooked in boiling water then placed over a sore eye. Like many other remedies, red currant was also brewed into a tea. 13 – Butterfly Weed – Butterfly weed was used only for medicine. Known as a multiple cure, the weed was believed to cure bronchitis, pneumonia, cough, gastritis, rheumatic fever, uterine disorders, and colds and influenza. 14 – Bergamot – The leaves and flowers of bergamot were used for scent and color. Leaves were brewed into tea giving an earl grey flavor to drinks. Flowers were added to salads. Internally, the herb cured digestive complaints. 15 – Yarrow – Like most other medicinal herbs, yarrow was given to relieve feverish illnesses, especially colds, influenza and measles, diarrhea, rheumatism and arthritis. Applied externally, yarrow provided relief from wounds, nosebleeds, ulcers and hemorrhoids. 16 – Mint – Mint is known for its versatility. Leaves were crushed, producing a pleasant aroma. People continue to use mint in tea, jelly baking and for masking the taste of medicine. In addition to soothing toothaches, it has been offered for upset stomach and headaches. 17 – Comfrey – Once served as a cooked or raw vegetable, comfrey is now found to be toxic. Comfrey was taken internally as a cure for bronchial diseases, ulcers and rheumatism. Externally, it relieved symptoms of arthritis, sprains, hemorrhoids and fractures. 18 – Catmint – Another herb that was brewed into a soothing tea was catmint. It was also used as an aromatic ingredient of potpourri. 19 – Lovage – Lovage was used for culinary and medicinal purposes. It was added to salads and mixed with lemon and sugar in a beverage. Relief from discomfort from mouth and throat ulcers was believed a result of topical application; ingested, lovage was a treatment for inflammatory swellings and fevers. 20 – Dill – A versatile plant, dill was used for aromatic, culinary and medicinal purposes. Leaves were known to scent a room; leaves and seeds flavor pickles as well as other foods. Upset stomach, gas and intestine disorders were treated wit dill. Dill continues to be used today as a culinary enhancement. 21 – Joe Pye Weed – Thought to be a cure for kidney and urinary disorders, Joe Pye Weed was used only as internal medicine. 22 – Angelica – Another medicinal plant, angelica is a multi-purpose plant.